Solar control low-e glass reduces the amount of heat that gets absorbed into a home during the day, making it an ideal window glass for moderate to warm (or cooling-dominated) climates. Windows in cooling-dominated (hot) climates transmit solar heat energy to the interior of the home. This is why your arm feels warm when placed next to a window on a sunny day. This transmittance of solar heat through glass is measured by the term “solar heat gain.” Solar heat gain only occurs during daylight hours and is concentrated along a home’s east-, south- or western-facing elevations. Many cooling-dominated climates have weeks or even months where direct solar heat can raise interior home temperatures above the desired interior temperatures. Solar heat transfer through windows occurs primarily in the glass area by the process of transmittance. Shading coefficient (SC) and solar heat gain coefficient (SHGC) measure the amount of solar energy transmitted by the glass. 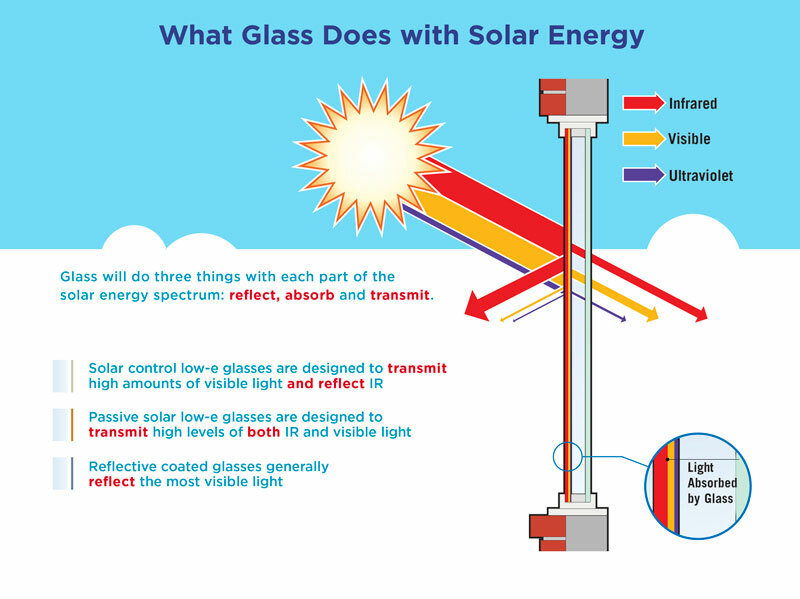 A lower SC or SHGC means less solar energy is transmitted through the glass and reaches the interior. With solar control low-e glass, the coating is applied off-line to pre-cut glass in a vacuum chamber at room temperature. This coating, sometimes referred to as a “soft-coat,” needs to be sealed in an IG or laminated unit and has low-emissivity and superior solar control performance. The best performing solar control coatings are manufactured in a process known as magnetron sputter vacuum deposition, or MSVD, and are ideal for mild to hot climates that are dominated by air conditioning. Solarban® solar control low-e glasses by Vitro glass are perfect for warmer climates. In addition to blocking more of the sun’s direct solar energy, it also improves thermal insulation (lower insulating glass unit U-values), which helps keep cool air inside and hot air outside. Radiant Heat Transfer is heat flow via absorption and then re-radiation. An easy example is when you put your arm into the direct summer sun and it starts to warm up. Convection Heat Transfer is heat flow via air movement. An easy example is when a hair dryer is turned on and the hot air is projected from the end of the hair dryer. Conduction Heat Transfer is heat transfer through materials. An easy example of conduction is when the handle of a pot on the stove gets warm. The heat is being conducted from the bottom of the pot all the way to the handle.